Jess and Pete Tatlow, the owners of The Golden Fleece would like to welcome you to their pub and dining rooms. Jess and Pete both grew up in the local area and had fond memories of the pub under previous owners. After the pub had been closed for 10 years they were presented with a an opportunity to restore it to it’s former glory and took possession of it in 2010. They were keen to retain and enhance many of the buildings original features, and they kept this in mind during the extensive refurbishments, carried out by local tradesmen. 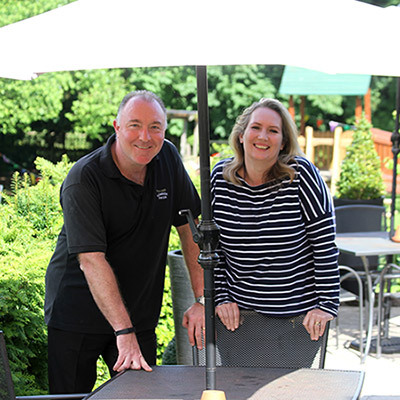 Jess and Pete’s aim was to breathe new life into the business and have ensured that it has regained it’s place at the heart of the community as a delightful village pub and dining rooms. Their goal is to exceed their customer expectations, to be welcomed by the friendly, well trained staff and to experience a wide variety of excellent food and drink. Many of the staff have been with Jess and Pete for a number of years, both here and at their previous pub in Watton-at-Stone. All the staff are well informed about the drinks that they serve. They can advise customers as to the suitability of dishes on the menu for their individual dietary requirements. Jess has a flair for cooking and regularly updating the menus. As the head chef, she runs the kitchen team ensuring the consistently high quality of freshly prepared dishes. Pete manages the front of house and personally selects a wide variety of local ales and beers alongside the well-loved Adnams Southwold bitter. The wines are hand-picked to compliment the menus and there is a fantastic array of spirits.